When I was introduced to only a few details of the story in Hidden Mysteries: Salem Secrets, I immediately thought about Sleepy Hollow movie. If there are those who liked the movie among the players, they might find it as another attractive feature. The game requires your total attention if you want to proceed. You get only a short description of the situation you are in. The problem is stated as a short order to go to a certain place, find out what is actually going on there and maybe fix it. But upon arriving you find out that things are a bit more complicated. You were informed that there were four girls in the village who were behaving in a very weird way and got missing after all. Your task is to investigate the case, but when you arrive to the village, the atmosphere reminds I Legend movie. There is not a single person in the streets, and the doors are "decorated" with the notes asking not to bother the owners, or telling about the fears of the village citizens. The building you have access to are mostly empty and abandoned sometimes. 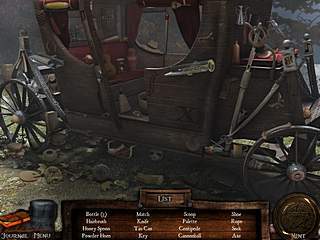 The game features two main kinds of activity. As you wander from one building to another you come across areas for some hidden object searches. What else you come across are the locks, locked doors, and other things that involve some interaction on your part. The searches are a not very easy. Most of the time because of the colors that the game uses. It is clear that grey and brown creat the atmosphere requires, but it is no fun to do the searches in those rooms, where there is nothing to please the eyes. The seek-and-find levels provide hints on a rechargable basis if you stuck. And some of the items will go the inventory to be used somewhere else in the game. The interactive parts of the game are not strictly devided into separate levels, but rather you can go everywhere you want. In those places you run into the challenges to solve. This means you need to keep in mind everything you come across, because otherwise you won't have any idea as to how and where to use the inventry items you find. 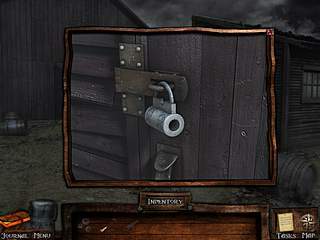 In this way the game requires your total attention if you want to proceed. The game is a great for the interactive levels fans allowing them to show the best of their skills. 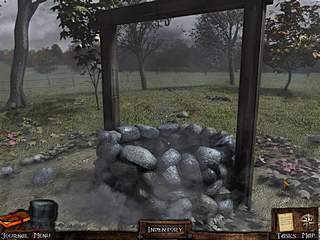 This is Hidden Mysteries: Salem Secrets review. Download this game here.